Automatic slide translation enables your audience to easily get your slides in their native language on their mobile devices. Here’s how you can get started in 6 steps. 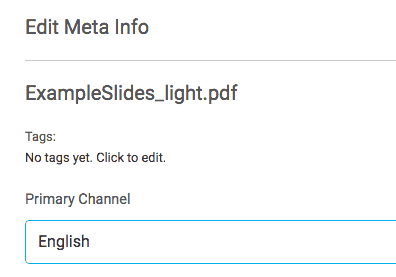 Click here for instructions on how to upload slides. You can upload your slides as a PDF file or as images. Click to open the slides and click on “Meta info”. In the language overlay dropdown, pick a language you want to translate into. In this example, we selected “Bahasa Indonesia”. If the language overlay for “Bahasa Indonesia” does not exist yet, you will be prompted to create it. Select “Yes” and you will see a progress bar while the slides are being translated. When the process is complete, you will see your slides overlaid with the translations. The text detected on the slide is highlighted with a thin red box. You can click on the text and make corrections to the translation if you wish. Press “Save” to save your changes. If you haven’t already, create a session for your presentation and assign your slides to it. If you have multiple pieces of prepared content for your session, use a playlist to assign them all to one session. The session’s QR code or URL is located in the session editor. Share them with your audience so they can access translation on their mobile devices. Your audience selects their language and then they will see the translated slides on their mobile device as you release the slides in your native language.